Originally, the University of Chicago planned for the residence hall and commons to be completed by fall of 2017. After further evaluation, it was determined that the design-build process would allow for the design and construction phases to overlap, allowing the project to be completed an entire year ahead of projections, which was the driving factor behind this delivery method choice. This also allowed the owner and design team to budget more effectively during design and eliminate the procurement process to save additional time and begin the construction process earlier. 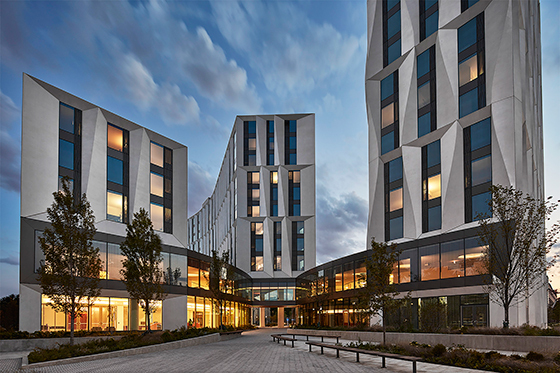 The University of Chicago Campus North Residential Commons creates a welcoming gateway, blurring the line between campus and community. Four buildings ranging from one to 15 stories are interconnected by various plazas, gardens, walkways and courtyards. The 400,000-square-foot, 800-bed residence hall provides common areas, apartment-like living spaces and a top floor Reading Room. A dining commons, offices, classrooms, music practice rooms, outdoor green spaces and 10,000 square feet of retail space are also included.